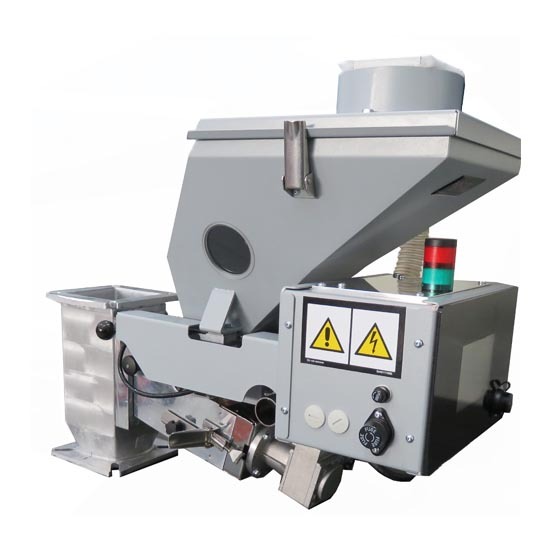 The gravimetric feeders of the DG series have been designed to automatically and accurately dose master and additives. Thanks to high precision of dosing, DG series can be installed on injection moulding machines, blow-moulding machines and extruders. DG series can satisfy a throughput from 90g/h to 18 kg/h depending on different dosing cylinder applied, that can be easily and quickly interchanged. The loss-in-weight control ensures a perfect dosing even when density of the components changes, and Lack of material is detected by load cells and signalled by a specific warning device. USB port to download recipes and weigh logs into an external storage device. • Lower slide gate to discharge material. Extremely precise dosing resulting in significant increases in quality and cost savings. Always reliable thanks to the continuous calibration of the gravimetric system. Easy to use thanks to its simple operator interface.